Very light liquoring with exquisite fresh green tea character. In the cup the leaves virtually return to life. A tea to remember. Cup Characteristics: Greenish yellow colour. There is good body in the cup and smooth fresh greenish tasting liquor. Hyson translates to “Flourishing Spring” and this particular varietal imparts the fresh green character you would expect to be a part of any springtime tea experience. Traditionally hyson referred to old to medium leaves (leaves below the new growing shoots at the top of the bush) manufactured in a rolled long twisted and sometimes almost clam shaped. 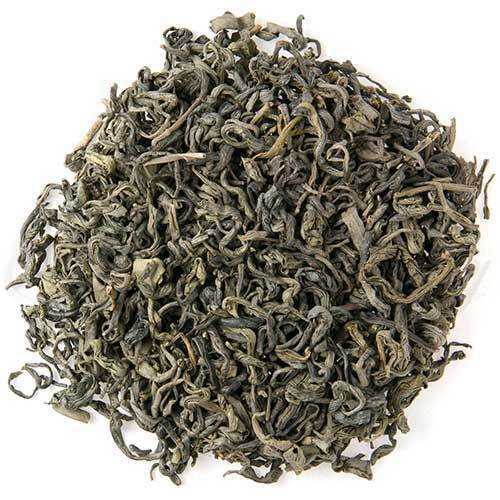 The term „young‟ was added to the nomenclature to distinguish that the tea was made from young leaves (new shoots) and therefore better quality and better tasting. This tea became so highly favored in the 1700‟s that the British Tea Tax was actually higher for this variety over other teas. Lucky Dragon is from a specific factory that further identified their tea because even though produced in the young hyson style it is much better than typical young hyson. Right from the first sale of tea in England in the mid 1600‟s, the English took a shine to tea. The government quickly realized the possibilities and levied taxes on tea that remained until the late 1700‟s. With all the associated taxes on tea and „young hyson‟ being taxed even higher! there were all sorts of various schemes done to dodge the taxes. Servants in upper class homes would dry the used leaves and resell them. Other unscrupulous people would „cut‟ the tea with leaves from various trees such as beech or hawthorn. Smuggling China teas into England reached a feverish peak in the mid 1700‟s and the ports of France and Belgium were used as the „jump-off‟ points for night voyages to Cornwall and Wales. The Chancellor of the Exchequer and the East India Company were aware of the extent of their losses and realized that only a large tax cut would make legal imports competitive with contraband tea. This finally occurred in 1784 with the passing of the Commutation Act.